Healthy eating can sometimes get a bad rap. Only weirdos workout AND eat bird seeds right? Fun fact: not all clean recipes are flavorless and boring. We happen to know about an amazing turkey burger that will knock your socks (and maybe some extra pounds) off. Behold: The Sun-Dried Tomato/Feta Burger! Take in the tastes and smells moving from your imagination down to your taste buds. We know you won’t be able to get enough of this holy grailish morsel of burger Valhalla. Feel free to substitute your protein of choice in place of the ground turkey, just try and keep it relatively lean to keep those calories in check! We used an Orowheat Sandwich thin for a gourmet bun but the guts–AKA, the fantastic flavor– haven’t changed. Once the ingredients are combined, this burger, despite having to “stuff it”, is pretty easy to make and great either grilled or baked in the oven. (RIP beautiful weather that allows us to BBQ in warmth for hours on end.) The oven is still a magical burger concocter! This recipe makes about five (8 oz.) burgers or six (6 oz.) burgers. So you can invite most of the squad over. TIP: They’re great reheated for lunch the next day. Truth be told, this recipe does require a little love and patience. But oh, does it pay off. Using a food scale (if you don’t have one anyway, you need one) separate the meat into 6- 8 oz. portions. Since we’ll be stuffing these burgers, you’ll then need to divide the portions in half to make two 3-4 oz. patties. 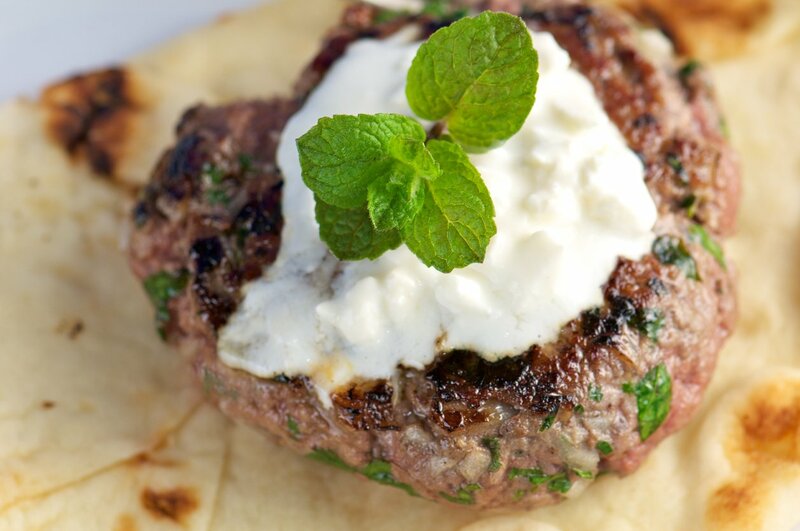 Take serving sizes of Feta (28g), sundried tomatoes (10g) and pepperoncinis and cover one of the patties. Place second patty over the first, pinching at the sides to seal the feta, tomatoes and pepperoncinis inside. Your burgers may be thick and rounded from all the yumminess inside so you may need to pat your patty down to flatten a bit. Repeat this step until all burgers are finished. Toss ’em on the grill/in the oven for 20 minutes at 400 degrees. The real x-factor for these burgers is the basil mayo. This is where you impress your friends. Scoop (or squirt) one cup of mayo into an appropriately sized container. Add chopped basil. If you had basil in the garden this year, now’s the time to bust it out, mincing about 15-20 leaves (dried basil will work here as well). Mix and you’re done. When the burgers are finished (make sure the meat is white all the way through if cooking with turkey), spread a tbsp. of your new basil mayo on a sandwich thin, place the a burger on the thin and instead of lettuce, use spinach as a topper. It’s still incredible that way. Boom goes the dynamite. Don’t be surprised if Guy Fieri calls trying to learn your ways. This is a great meal to follow up a workout with to keep your protein intake high without sacrificing taste. Enjoy!